I have always enjoyed the theatre. I go there to take pictures for a nostalgic look. This time I definitely played around and tried something different with my new Guess watch! I opted for a structured theme of clothing. A pair of prominent high-waisted denim jeans that have tons of detail that track their day-to-day journey since it left the factory. From the rips, to stonewash, and the tight fitting components that help show off all things curvy and prominent in a female! Denim was a must, combined with the blue details of this GUESS timepiece. I paired these jeans with a pastel blue crop-top with high neck details, a pair of black stilettos and, of course, my favorite fashion item to bring out my look: my Victorian-inspired white coat. With the lace details, the gold buttons, the tight fit around the waist and the cream hue, I thought I simply could not go wrong with this look! When I created this look I was feeling very glamorous – from the inside out. That’s a feeling that women sometimes lack when they go out, they feel uncomfortable with what they’re wearing. 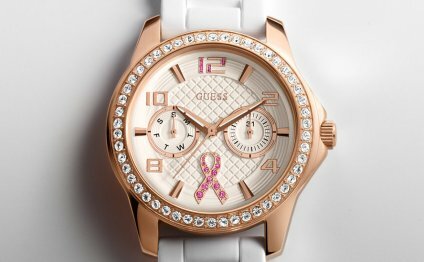 I firmly believe that women should feel comfortable, especially when they express themselves in the world of fashion, and they should also have a GUESS timepiece to complete the package. I love refurbishing old items that I have used before, or rather, that’s been used years before I was even born. I love adding vintage details to outfits; I feel if you wear something vintage, you are wearing a piece of history that you haven’t seen. The coat is older than me and I felt like the coat paired with the historic setting emphasized the watch; an old versus new era. It highlighted every glamorous detail of the watch. I firmly believe that fashion is all about the details!